The ‘Classic’ style is well known and popular. 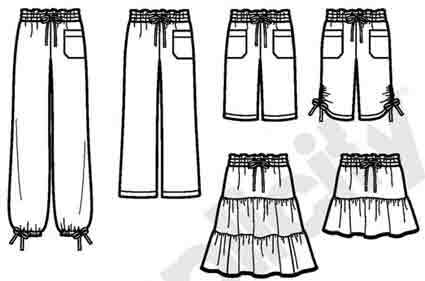 Many basic wardrobe plans are based on classic styles. Judith Rasband‘s simplest wardrobe cluster is a group of 5 items. Her March 2012 newsletter makes the case for wardrobe basics very clearly, These simple clothes with very few added style elements are mainly what is called the ‘Classic’ style. With a wardrobe built on basics, you can afford a more complex or decorative garment once in awhile because it will go with most of your basics, adding a surprise element to your usual looks. Building your wardrobe on basics is the way to go! Rasband counts a style ‘basic’ if it’s so simple that it will co-ordinate easily with pretty well any other style. 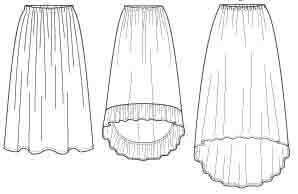 So, for example, a ‘basic’ top co-ordinates with almost any skirt or pants style. One of each of her basics would give you a ‘cluster’ of 5 items, perhaps as many as 10 different outfits. Basics which include a blazer jacket also make good business wear for many people. Their simplicity means they don’t draw attention to themselves but do look efficient. suit fabric : blazer jacket, straight skirt, pants. dressier fabric : zip-front jacket, sheath dress. lighter fabric : sleeveless top, a-line skirt (together make a 2-piece dress). I reckon you can make 21 different outfits out of these, enough for every day of a working month. Add another blouse or shirt and that adds 9 more combinations. Similar classic styles make the basis of many other published wardrobe plans. Such as Nancy Nix-Rice’s basic wardrobe, newsletter issues 21 – 28. You only need a couple of wardrobe patterns and 4 fabrics. darkest neutral suit fabric : jacket, skirt, pants. lightest neutral shirting : shirt (shorten dress). 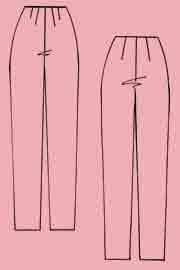 mid neutral dress weight : top, a-line skirt. mid neutral dressy fabric : jacket (made without collar and with zip front), sheath dress. There are versions of the classic styles which look more ‘modern’ because they are crisp, close fitting, a little edgy. The Vivienne Files frequently suggests basic minimum wardrobe groups in ‘modern classics’ style. – 6 other garments in accent colour. That’s 7 neutral garments and 7 accents. Example here. And some of her other posts : one, two, three. This modern take on classics includes many knits. Her basics include tees, knit classic cardigans, and leggings as essentials. Tees, both fitted and looser and longer. Many tee patterns of course, one is McCall’s 6491. Knit cardigan closing to neck, see Butterick 5760, first pattern mentioned in this post. 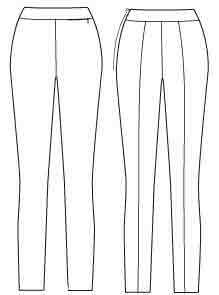 Slim pants pattern by Palmer-Pletsch, McCall’s 6440 (seams down back, 4 hem styles). Leggings : McCall’s 6360 is one of many leggings patterns, 4 styles 4 lengths. As frequently happens, I find myself thinking about classics because many people write about them, even though I never wear them myself. Does the classic style make you feel your best ? or make you feel constricted and constrained and unable to be your true self ? It’s very interesting this. The Vivienne Files recently posted on her everyday basics here. I actually shuddered. She loves these, but if I had to wear them I would find it completely soul destroying. Even if they weren’t all black, they’re the wrong shapes and fabrics for me. Fascinating that people can be so different. For those of us who never wear classics ? We have to do a bit of thinking outside the box to work out how wardrobe plans like this match up with our own needs. I have a whole lot of reactions to all this, some of which I’ve cycled through many times before. As usual I feel so strongly about this I found myself writing several hundred words, so it’s become a separate post (here). There’s much to enjoy here. I’m fascinated by clothes and style, and I enjoy looking at and thinking about the classics. But it’s definitely not a style for me to wear myself ! How can we know what we’re getting before we finish sewing ? 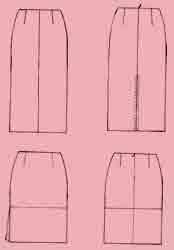 I recently wrote some comments at Stitchers Guild on sources of wardrobing advice for beginners. Ejvc commented it’s easy to find garments in the right colours, shapes, personal styles (all except fit !) when shopping. Because you can try before you buy. But much more difficult to get it right when sewing, because you have to wait ’til you’ve finished to know what you’ve got. Good points. But I think there are many things we can do to increase our success rate. We haven’t got to work completely in the dark until the last moment about what we’re getting. Incidentally, these are all things that designers do. They don’t expect to get their designs right first time without any testing of the real life item (as opposed to the mental dream or the glamourised sketch !). They develop on from styles that have been used before, rather than starting afresh for every garment. And they test frequently during development, so they can give up quickly and without guilt on styles that don’t work out. I always check colours and fabrics before cutting (preferably before buying !). Hold them up against myself in a full length mirror. Is it a flattering colour ? fabrication, texture, pattern in my style ? good on my body (too stiff or too soft) ? Also hold the fabric up to test how it drapes. If you have a dress form, pin the fabric on in a rough approximation of the style – does it look good ? drape right ? have the effect you were thinking of ? There is no longer a fabric shop here. And buying fabrics on-line is a problem for me. Small differences in shade can make a big difference to whether the colour is flattering. And those small differences aren’t usually reproduced well on screen. 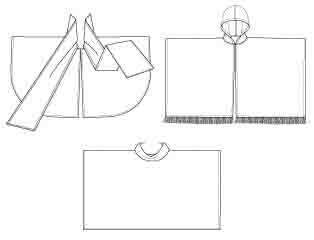 – fabrics that look different in a large piece than in a small sample. – fabrics that I’ve bought samples of, and then a different dye lot turns out to be completely different. . . But those problems happen less often than they would without taking any care. Sketching a style onto a personal croquis is a great help (if you have the skills 😀 ). Even if you don’t make fit alterations to patterns : know what wearing ease you like for this sort of style, and measure the pattern to make sure it won’t be too large or too small. 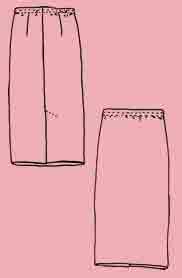 I remember a top in a favourite fabric that looked so fool-proof I didn’t make any measurements or trials – and it had cut-on sleeves that were too tight round the armhole. Though measuring doesn’t save me from all disasters. I made a top from a pretty print in just the right colour. PR reviews warned about the neckline. I carefully measured, and all seemed well. But when I tried the finished garment on, it slipped off my shoulders so much it was unwearable. If I had tried on either garment part-made, a simple alteration could have solved the problem. The neckline problem wouldn’t have shown up in tissue fitting, as it was caused by the way fabric flexed on my sloping shoulders, which made the neckline much wider in wear. There are many good reasons to make a muslin as part of the pre-planning – check the proportions, ease levels, style element placing, etc. as well as the fit, before wasting the good fabric. Moral – much basting and frequent try-outs needed at each possible stage of making. . . 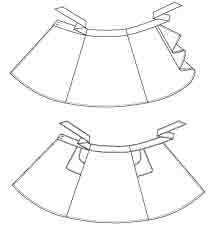 Many problems can be rescued (let out seam allowances, add a dart, pleat, or godet :D). If not, a UFO in the middle of construction is a better outcome than spending a lot of time finishing something that turns out to be unwearable. Go to a store and try on new styles to see if they flatter you, then look for a similar pattern. It helps to be aware of your own style – quickly filters out a lot of options. Remember one person’s ‘faves’ can be another person’s ‘never’. I enjoy a recent post from The Vivienne Files. Several of the softer items she avoids are my everyday wear 😀 (my thoughts on a successful cascade jacket are here). And most of the trim-fit ‘modern classics’ she loves would look dreadful on me – not flattering for my body shape, personal style, colouring. 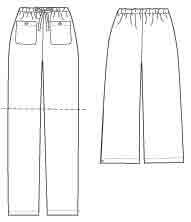 (Try Burda Style or styleARC patterns if you want to copy.) I do agree with her about many ‘no-no’ items, but a ‘goth’ or an enthusiastic fashionista would love those spikes and skulls or designer logos. Or perhaps you enjoy casual casuals (here are my posts on sweatshirts and hoodies). Or do you feel at your best in square cut loose fitting ‘arty’ clothes and love Sewing Workshop or Cutting Line patterns. I’m lucky I have a good visual imagination. I stand in front of a mirror holding a picture of a possible style, and imagine myself wearing it. Also while I’m around locally I imagine myself wearing the style. Has saved me from many mistakes. I now know it’s waste of time starting a project that I’m not sure about, as that will just languish as a UFO. Or find a designer that works well for you, and stick with their patterns. Not a 100% guarantee of success, but better than random. Here’s a valuable comment from CCCouture at Stitchers Guild. “I was just in Las Vegas for the International Textile Expo and lived a dream for a bit in the Chanel RTW Boutique in the Shops at the Bellagio. Improving your success rate is another good reason to develop new styles by changing details of familiar patterns. Or morph style elements onto good basic personal blocks. Rather than starting from scratch with a new commercial pattern every time. For every aspect of getting things right (colour, fabric, shape, fit, style, technique. . . ), the best tool for success is try on, try on, try on, at every stage possible. Many people enjoy the sewing but not the testing. And many other people like to just ‘jump in and have a go’. I think they have to accept that their emphasis is on the sewing not the result. So, much of what they make will be samples to learn from, rather than wearable items. For me, the good results are well worth the extra effort. Part of sewing success is a recognition of the use of time – it’s not just about sewing. Pattern preparation, fabric preparation (my biggest dislike), cutting out, marking, developing sewing skills and finding good techniques for a particular process, pressing, checking what you’ve made so far – they’re all processes which take substantial amounts of time to get right. They can’t just be rushed through (or left out altogether !). I’ve already posted on the quick top and dress patterns available. 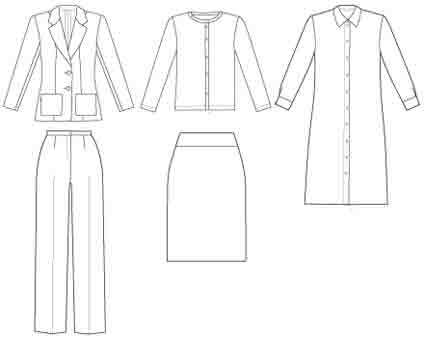 Here are some patterns for skirts, pants and jackets which the pattern companies claim can be sewn in 2 hours or less. Few of the patterns in my previous post on quick skirts and pants are still in print. Happily there are several to add. McCall’s 6567 elastic waist skirt with various lengths and hems, there’s also a mock wrap version. Simplicity 2368 skirt with dirndl, mock wrap and 4 gore styles, 3 lengths. Silhouette 2050 straight wrap skirt with darts, button closure, no vertical seams. Silhouette 3400 yoga pants. Also webcast and DVD about using this pattern. Webcast and DVD say how to convert for wovens. 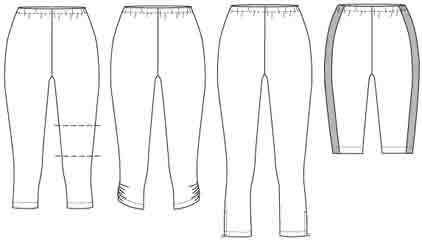 Textile Studio Soho Pant, slim fitting with darts and invisible zip. I haven’t found many new patterns for jackets, but fortunately several of the patterns mentioned in my previous posts are still in print. Not so quick, but there’s a new version of the Palmer-Pletsch 8 hour jacket, McCall’s 6172. For outerwear, there’s McCall’s 6209 ponchos, which have a variety of shapes and necklines, not all shown here. And nearly all the patterns in my post on fast jackets from independent designers are still in print. 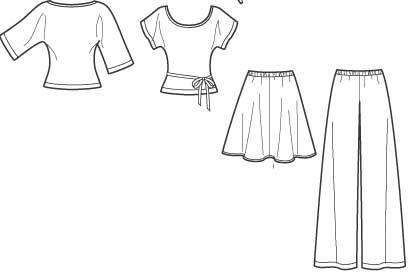 This year the focus of the Stitchers Guild Sewing With A Plan contest is Tried ‘N True patterns you can use repeatedly to make clothes that work well for you. Would any of these speedy patterns fill that role for you ? So have you got time to complete your SWAP wardrobe ? 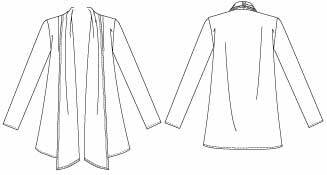 Holiday weekend – enough time to make a ‘Core 4’ of top, jacket, skirt, pants. Or, if you’re just missing one item for SWAP, find 15 minutes a day for the rest of the month.